New Zealand is a land of beauty, magic, kindness, food, art and many more things. It is a small country with only a few million people but it has so very much to offer. 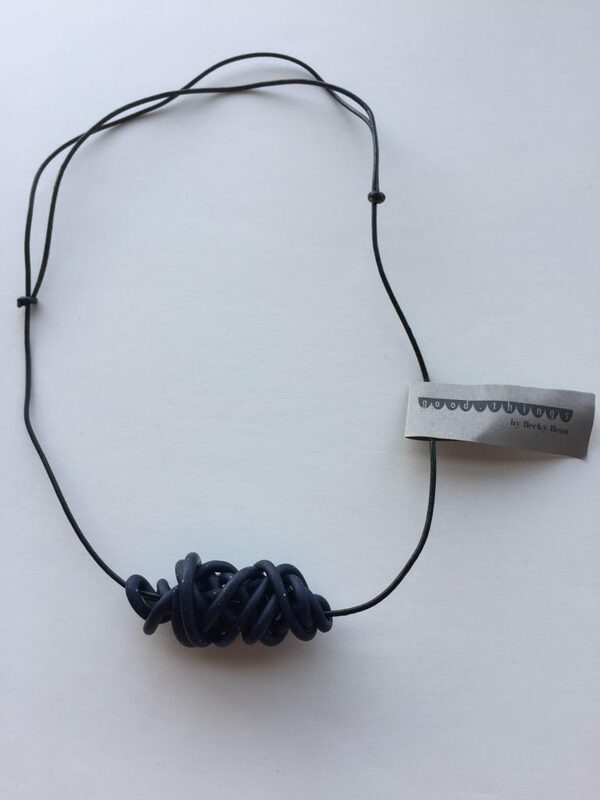 The artists and varied range of art within the country is stunning and I was lucky enough to find a few artists who made jewellery, art I could wear, which I purchased and will enjoy wearing for quite a while. 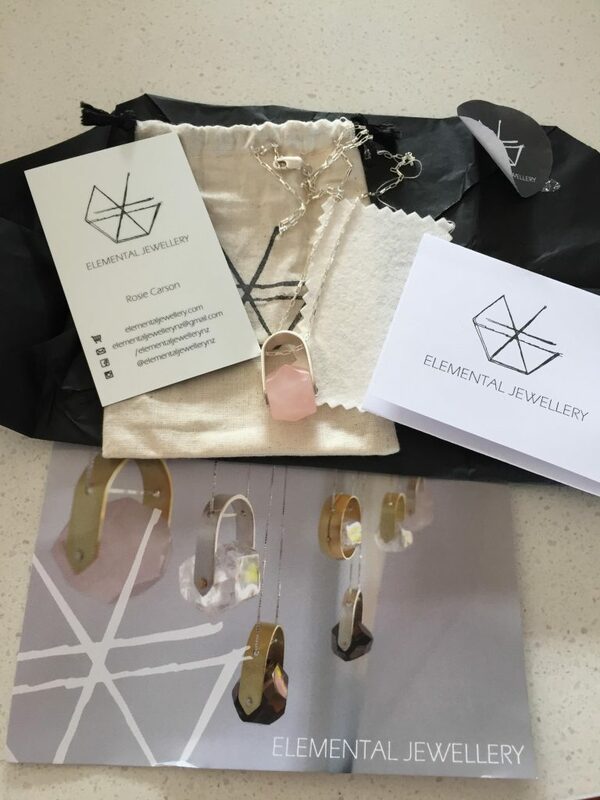 I was visiting with a friend in Auckland when I first saw one of Elemental Jewellery’s pieces. 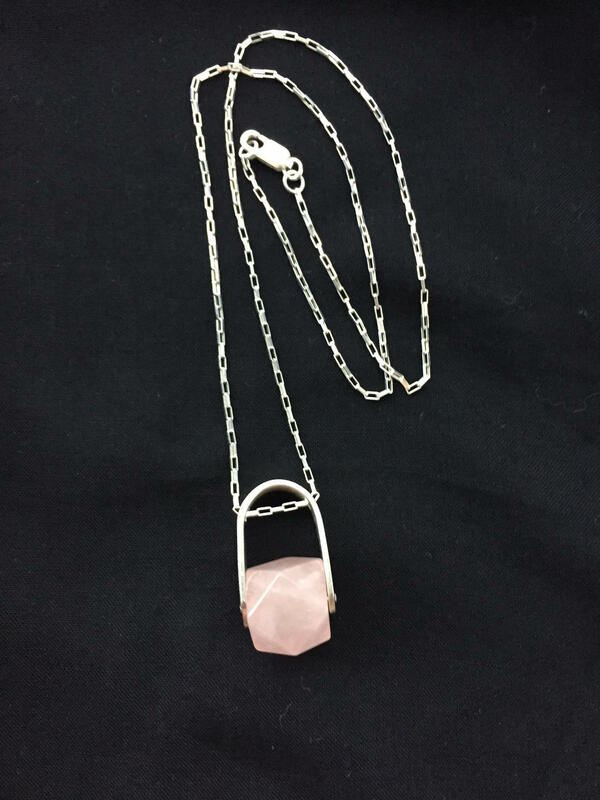 My friend was wearing this beautiful, long, silver pendant necklace, on a silver link chain, with a rose quartz. I absolutely loved the strong, silver, horseshoe design mixed with the soft, pretty, rose quartz gemstone. I’ve seen quite a lot of jewellery made with gemstones before but this necklace had a high-end, sturdy, clean lines, yet beautiful, whimsical look about it and I had to have my own. Thankfully when my friend contacted the designer/maker, Rosie Carson, she had a shorter one (approx 25cm) in stock that I could buy and receive before I left the city. 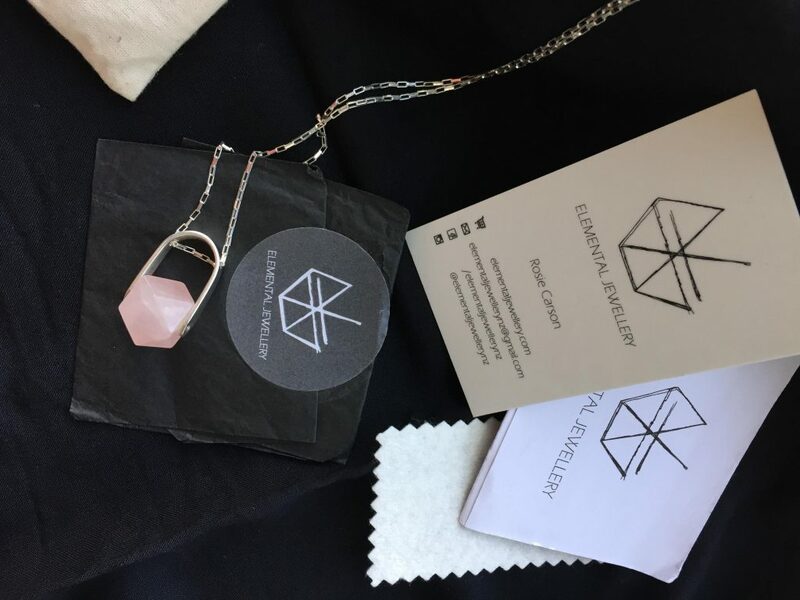 I absolutely love my new silver pendant necklace with rose quartz from Elemental Jewellery. It is made very well with strong metals and built in a sturdy manner so that it will hopefully last me for years. While the necklace doesn’t look delicate or fragile, it is still very feminine and pretty. Also, because it is more of a clean line, contemporary style, I have been able to wear it with everything and for a wide range of occasions, from everyday casual clothes, including leggings with a comfy shirt to casual pants with a blouse, all the way through to fancy dress going to the opera. The compliments I receive on it are nice too. I am definitely very happy with my Elemental Jewellery, silver pendant necklace. **Click on the bold name/title/link above to check out the Elemental Jewellery website and purchase your own. When I was in Wellington I spent one of my days in the CBD, shopping and seeing sights. It was absolutely pouring rain outside most of that day so I was trying to spend as much time as I could indoors. That goal brought me to the New Zealand Portrait Gallery and I am glad it did, for several reasons. One, of course, is that it was dry and warm in there. Two, it was in a wonderfully, old, historic warehouse. Three, it introduced me to the works of several New Zealand artists. And four, it introduced me to the Tangles, jewellery created by Becky Bean under the name of Good Things. There are several different styles but I immediately loved these Tangles when I saw them. For some reason, they just remind me of chaos. That life is chaos. 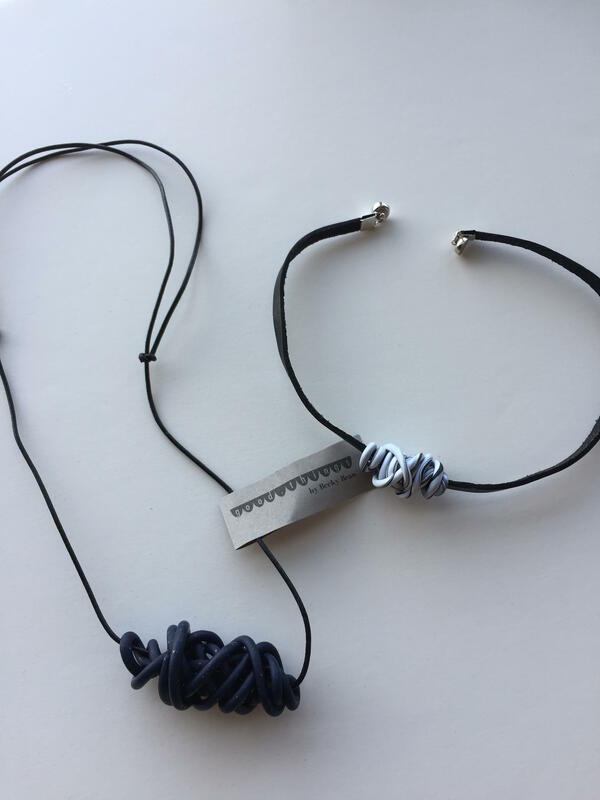 I bought myself a bracelet with a white and black Tangle because I loved it so much and wanted something I could wear on a regular basis, and I also bought myself a necklace of a larger navy blue Tangle with flecks of navy blue glittery pieces in it. The Tangles are made from polymer clay so they are quite durable but they can also possibly be damaged. My bracelet is on a 5mm wide black, leather strap with a magnetic clasp and my necklace on a very thin, adjustable, black, leather strap. The necklace strap is very soft and slides easily to adjust but the bracelet strap doesn’t feel like leather, it is not very soft. I really like the simplicity and ease of the magnetic clasp on the bracelet though, unfortunately the length of the leather strap is an awkward size. 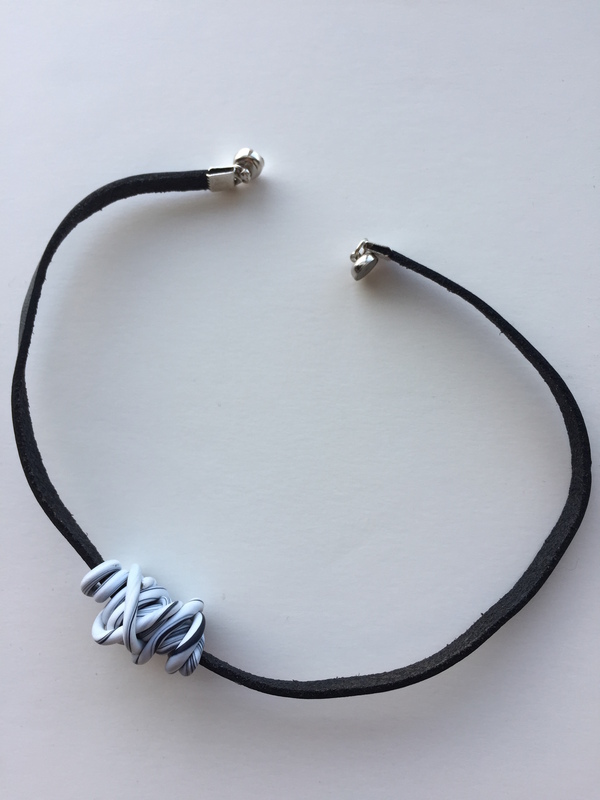 It means that it is way too large but when I double wrap it around my wrist, it makes the bracelet quite snug so that every time I somehow catch it on something, the magnetic clasp unhinges. I have almost lost it, several times. The bracelet strap is something that I can adjust and fix, thankfully, because I really love these Tangles. Whether it was meant or not, the Tangles make me think of the chaos of life and how we always come out of it. Wearing this reminder as a piece of art, just makes me really happy. **You can check out the Good Things website and purchase your own by clicking on the name/title/link, above.